Bring the Protection of Saint Michael the Archangel to Your Collection! Revered in Christianity, Judaism and Islam, the Archangel Michael is a divine messenger, warrior and guardian. A protector against the forces of evil and a chief intermediary between God and humanity, he plays a role in several of the Bible's epic stories. In the Catholic faith, Saint Michael (as he's also known) is the patron saint of soldiers, paratroopers, police, doctors, mariners, the sick, the suffering . . . even grocers! For those who need protection and strength, St. Michael's guiding and healing power brings welcome peace and encouragement. Saint Michael is also the patron saint and protector of Ukraine, as well as its capital Kiev. Having endured centuries of rule under other countries, Ukraine finally achieved a lasting independence in 1991. So, naturally, the Archangel Michael makes a perfect choice as the country's symbol of hope, healing and protection. 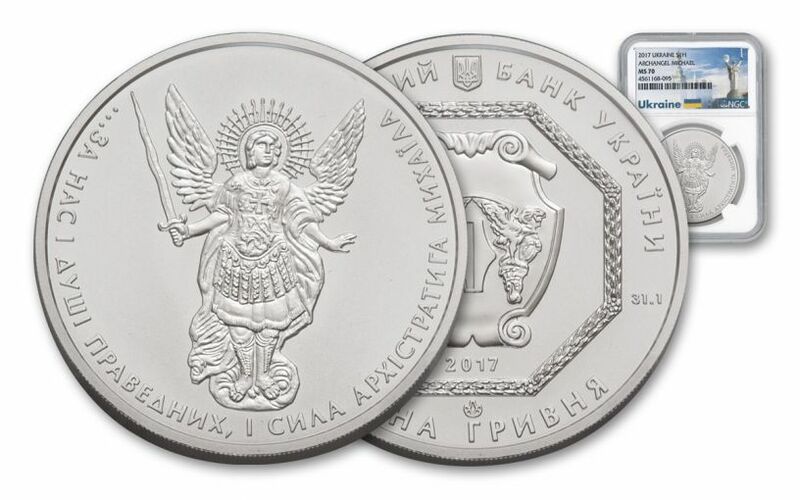 The Archangel Michael also graces the beautiful bullion of Ukraine -- stunning coins that you can bring home to your collection! A HEAVENLY DESIGN!-- Archangel Michael stands proudly on his namesake coin, wings spread and arms outstretched with a sword in his right hand. Surrounding him on the coin's reverse is a line from Taras Shevchenko's epic poem "Haidamaky." Translated from Ukrainian, it reads "for us and souls of righteous men, and Archistrategos Michael's Strength." 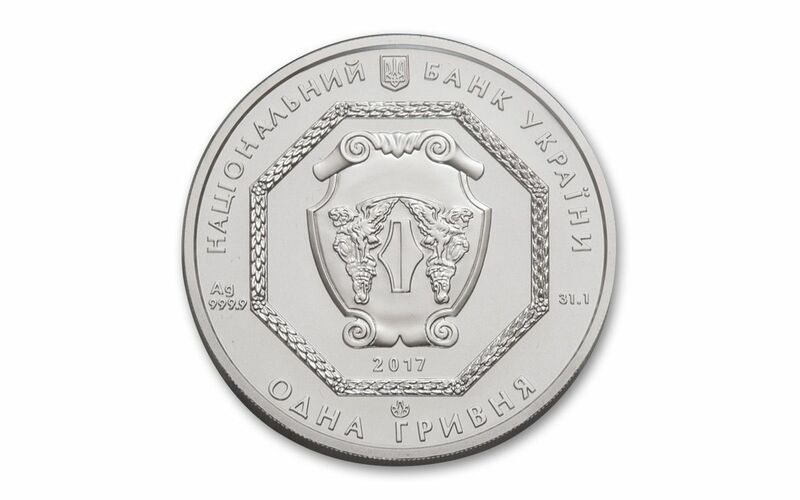 MINTED IN HIGHLY PURE SILVER-- Flip this 2017 coin over and you'll discover the bold emblem of the National Bank of Ukraine, featuring a griffin and a hryvnia as protectors of the country's wealth. You'll also find proof of this one-ounce coin's 99.99% fine silver content as well as the Ukraine's coat of arms. 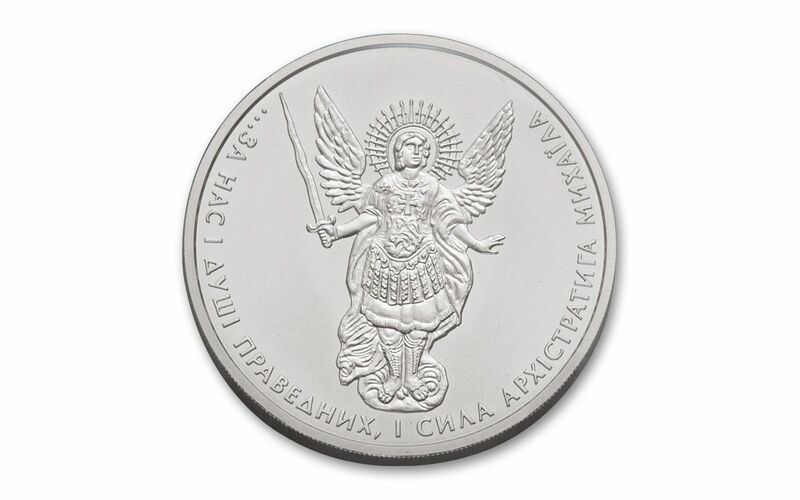 UKRAINE LEGAL TENDER-- Each gorgeous 1-oz Silver Archangel Michael coin is one hryvnia Ukraine legal tender. CERTIFIED FLAWLESS-- Your coin will come certified Mint State-70 (MS70) by Numismatic Guaranty Corporation (NGC), a distinction that means your perfectly-graded 2017 Silver Archangel Michael coin will have ZERO imperfections -- showing all features and fields exactly as the engraver and mint intended! In addition, your coin will be sonically sealed in a protective acrylic case with a special Ukraine label featuring Kiev's 340-foot tall Motherland Monument. A LIMITED-MINTAGE SERIES! -- Struck since 2011, the Ukraine Archangel is still a fairly new bullion series with annual mintages never reaching more than 30,000. Take its limited production numbers along with its symbolism and beauty and you have one incredibly collectible coin! 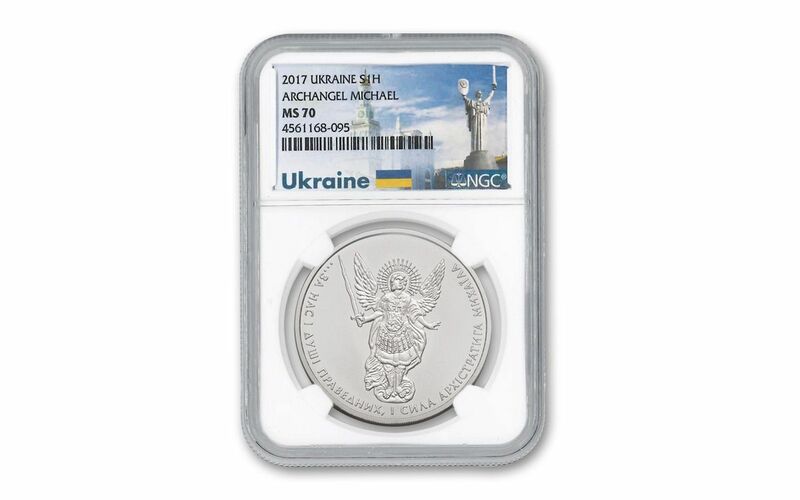 Whether you're a silver stacker or love great coin art, have Ukrainian heritage or know someone that needs some extra protection in their lives, this 2017 1-oz Silver Archangel Michael is perfect as a collection addition or gift. Don't let this opportunity fly away -- spirit one to your cart now!